The art of wax casting with glass is such an ancient process, that the head of a Pharaoh ( Amenophis ) was known to be cast in Egypt between 1435 and 1415. In New Zealand, we are fortunate to have internationally renowned lost wax cast glass artist, Ann Robinson, who is known worldwide for her refinement of this technique into an art form. Robinson’s vessels and bowls are renowned for their profound beauty, organic natural forms, as well as their ability to contain and transfuse a clear and pure light that seems to change with it’s surroundings, thereby emitting an almost inner glow. Similarly, New Zealand’s botanica and landscape are echoed in her glass pods and vessels, with many reflecting the forms and shapes of New Zealand flora. The New Zealand Nikau palm and the Phormium (flax) can be seen in her organic repeating patterns and shapes held in each piece. She has stated, "I like the idea that my pieces encapsulate the music of the forest." Transforming glass through the process of wax casting glass, to produce such artworks of instrinsic beauty is no mean feat. In her refinement of this technique, Robinson somehow transcends the weight of glass and produces receptacles of exquisite beauty, despite their mass and scale. Robinson was born in 1944 and first attended the Elam School of Art in the late 1960’s majoring in Sculpture, (specialising in bronze casting). After a 15 year hiatus, she studied glass blowing and experimented with lost wax casting, graduating from Elam in 1980. Alongside Garry Nash and John Croucher, Robinson began working at ‘Sunbeam Glass Works’ in Auckland, NZ, before leaving in 1989 to work soley on her experimental lost wax casting technique. Robinson has taught this technique throughout the world. She has exhibited nationally and internationally and her work can be found in many renowned collections, including the Corning Museum of Glass (USA), the Victoria and Albert Museum (UK), the National Gallery of Victoria (Australia), the Auckland Museum (NZ) and the Museum of New Zealand Te Papa Tongarewa, (NZ). In 2001 she was awarded the ‘Officer of the New Zealand Order of Merit’ (ONZOM). 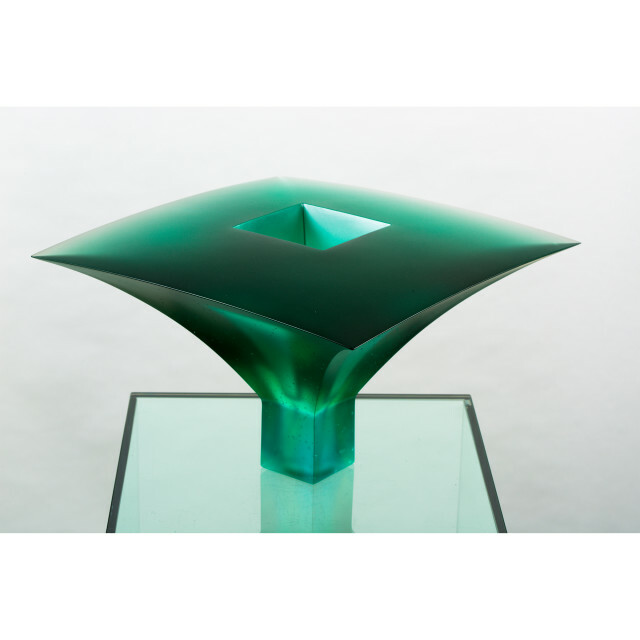 In 2004 she received a New Zealand Arts Foundation Laureate Award and in 2006 she received a “Lifetime Award” for her services to glass from the American Glass Society. Also, in 2007 she was comissioned by the Holy Trinity Cathedral in Parnell in Auckland to create a font for the Cathedral’s baptistery.This piece is cast in five pieces of solid glass.